If You Like This You Should Watch: Toy Story, Monsters Inc. Yes, The Movie Mind went to go see a kids’ movie. But before I start running through excuses such as taking my niece and nephew and it being a rainy day, let me just get this out in the open: I am absolutely THRILLED that I got to see this movie. This was one of the most creative, clever, and utterly brilliant films I’ve seen in a long time. Notice I didn’t say it was a great “animated” film; I said it was a great FILM. The genius it took to put this story, scenery, writing, and characters together helps me realize why there’s only been crap in the grown-up box office lately: everyone worth a damn in the film business must be making animated films. Wreck-It Ralph is a must-see regardless of your age and I’m not scared to admit it. Wreck-It Ralph is a classic old-school video game villain and can be best compared to a cross between a human version of Donkey Kong and one of the Rampage monsters. There was no better selection for the voice of Ralph than John C. Reilly as he truly brings him to life. Ralph is the villain for a game called Fix It Felix, and the game is celebrating its 30th Anniversary. While it should be a time for celebrations, Ralph is fed up being the villain. He longs for the adoration, attention, love, and ultimately, the medals, that Fix It Felix Jr. has earned over the last 30 years as the hero of his game. Ralph even attends what can best be described as group therapy sessions for villains. These scenes make for some of the funniest moments of the entire film, but the sessions don’t change Ralph’s heart. He ends up “game-jumping” so he can try to earn a medal and ultimately the love and adoration he so desires. Instead, the big goof and ends up screwing things up royally but not before plenty of hi-jinx ensue along the way. The setting of the film centers on an alternate universe based inside a coin-operated arcade. Each game is connected to each other through the power cord and surge protector. The surge acts as the aptly titled “Game Central Station” where characters can take virtual subways through the games’ power cords to arrive there. The goal of each game is stay in operation and make sure they never get the dreaded “plug pulled”. If they do, they join a few other famous former game superstars now living in Game Central without a home. The characters play their roles inside each video game and then go back to their “normal” lives once the arcade closes. The game heroes usually go up to their penthouse apartments and party all night just like Fix It Felix Jr., yet the villins go to therapy or drown their sorrows at “Tappers”, the root beer bar server game. There are so many brilliant themes and games integrated seamlessly into this film that you could watch it over and over and still find something new each time. While there is still your standard kid-movie message about how you don’t need a medal to be a real hero, it’s still not as obnoxious as some of the forced propaganda and “hidden” messages in our own grown-up movies. It’s nice to know that it’s still possible to make us grown-ups laugh without the standard over-the-top crudeness so prevalent in most films nowadays. That’s the definition of true creativity. Disney has built pure magic here, so much so that I already find myself wondering when the sequel will come out. When it does, I’ll go run and see that too. Hopefully my niece and nephew will accompany me again, but if not, I’ll be there anyway. Interesting Cameo Appearance: There is a virtual cornucopia of old school video game characters making cameos in this film (Q-Bert, Sonic the Hedgehog, Pac-Man, Bowser from Mario Bros.) making for great throwbacks as if we were watching a Where Are They Now episode of 80’s and 90’s video games. Vanellope von Schweetz: What’s your name? Wreck-It Ralph: I don’t know. Why are you so freakishly annoying? Wreck-It Ralph: They invited Pac Man? That cherry-chasing dot-muncher? Vanellope von Schweetz: I guess you really gotta watch where you step in a game called “Hero’s Doodie”! Sergeant Calhoun: It’s “make your mommas proud” time! Wreck-It Ralph: I love my mamma! Wreck-It Ralph: I flew a spaceship today! Vanellope von Schweetz: You crashed it. 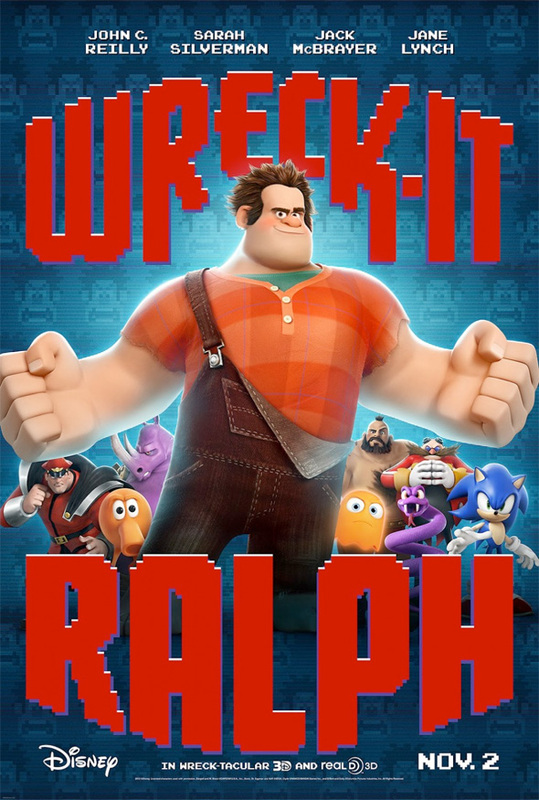 Wreck-It Ralph: I’m bad, and that’s good. I will never be good, and that’s not bad. There’s no one I’d rather be then me.